In this Summer issue we look at the alternatives taking place beyond the market and the state: The emergence of self-provisioning in food, finance and technology that has come from a new impatience but also, and more importantly, a new confidence in our ability to confront today’s challenges. I interview environmentalist George Monbiot and he speaks about his vision for rewilding Britain and how successive rounds of enclosure prevent us from thinking of the land as ours. He also argues that we’ve only ever been given the false choice of private or state ownership, and puts forward the commons as paradigm for looking after our shared resources (p.16). Dougald Hine goes further by arguing that our understanding of the commons should not be as “a pool of resources to be managed, but an alternative to seeing the world as made of resources” and presents the historical challenges for a movement that might identify itself with this new political name: The Commons (p.8). Long-time commoner David Bollier reports on the recent attempt by the EU attempt to enclosure the seed commons through the guise of regulating plant material (p.12), and cartoonist William Exley show us how to save our tomato seeds to share and swap with others (p.14). This month sees the arrival of the GrowUp Box — a converted shipping container — growing vegetables and fish in Central London! 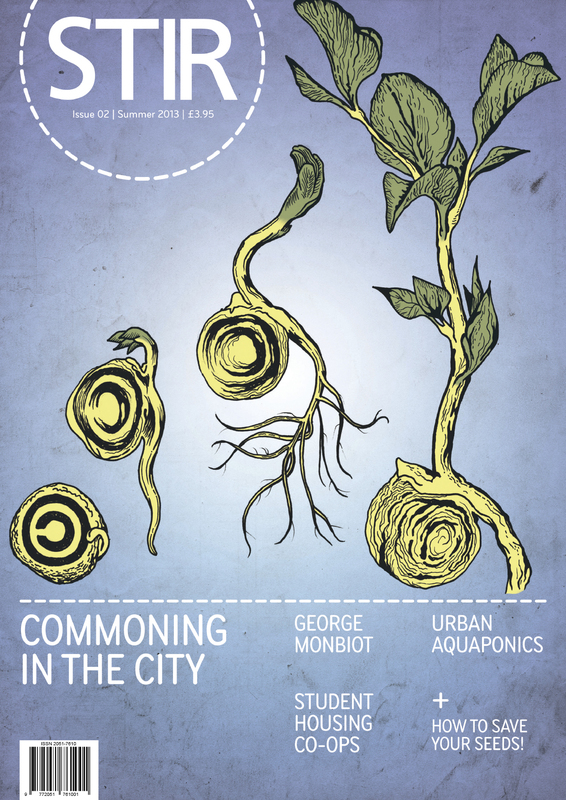 Starting small, this experiment in urban aquaponics has plans to scale-up as a commercially viable farm to show how aquaponics can begin to help the problem of feeding cities (p.22). The other side of this potential food crisis is explored by author Paul Kingsnorth through his new historical novel, The Wake, which looks at the collapse of our society after the Norman invasion and asks where are today’s resisters? The last ten years has seen rent double and tuition fees triple for students studying in the UK. In response a group of students from Birmingham University have started what might be the UK’s first student housing co-operative by buying two houses to rent for students studying in the city (p.24). Filmmaker Ben Mann looks at how film can be an important part of social movements in exposing the problems and also looking at the alternatives (p.36), while illustrator David Kerr looks at the UK’s military land and imagines what it would look like if the Faselane submarine base was closed (p.32). We also have a Wild Garlic Goat’s Cheese recipe from forager Robin Harford and eco-chef Tom Hunt of Poco, Bristol shows us how to share sougdough starters! It features original art by German Gullon, Jade They, Matthew Frame, Sam Parr, William Exley, David Kerr, Alex Charnley and Gabriel Ayala.